Once, they beamed optimism from walls all across the Eastern Bloc. These murals depicted Socialist progress, and allowed the great Communist leaders to look down on their people from everywhere. But now, they're fallen into ruin. 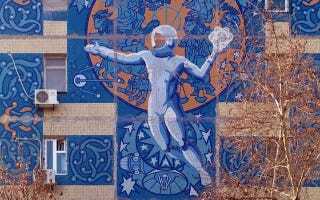 Check out the disintegrating beauty of great Socialist murals. Mosaic of a miner near the entrance to the mine Dolinskaya in Karaganda, Kazakhstan. Once its helmet had a working light source. Haus des Lehrers (House of the Teachers), Berlin, Germany, with a mural wrapping around the building, named Unser Leben (Our Life), designed by Walter Womacka. Bonus: The Olomouc Astronomical Clock, constructed in the 15th century, almost completely destroyed by the Nazis in May 1945, reconstructed in the style of socialist-realism in the early 1950s. There are athletes, scientists, workers instead of royal and religious figures.